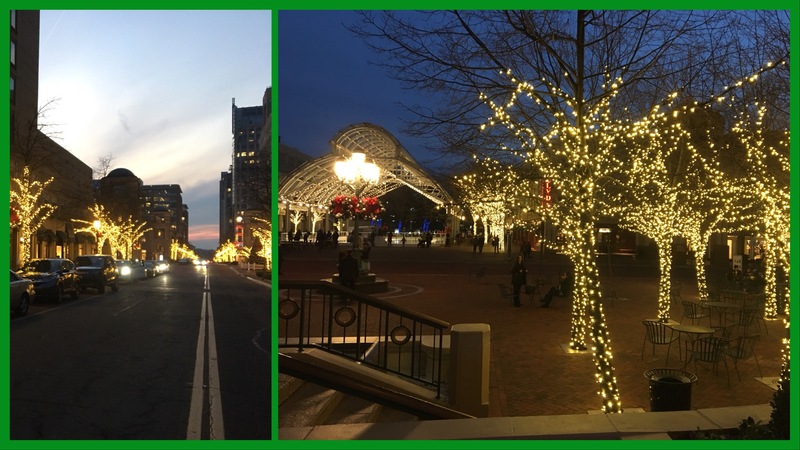 Home » RESTON TOWN CENTER PARKING, ARTINSIGHTS HOLIDAY HOURS, GIFT WITH PURCHASE, AND GALLERY UPDATE! RESTON TOWN CENTER PARKING, ARTINSIGHTS HOLIDAY HOURS, GIFT WITH PURCHASE, AND GALLERY UPDATE! Now Balducci’s is open across the street! How does that help us apart from the traffic? Balducci’s offers 2 hours free parking without any apps or parking kiosks. Now, we don’t advocate you parking there and walking out without supporting the place, but who among us won’t find something awesome there? 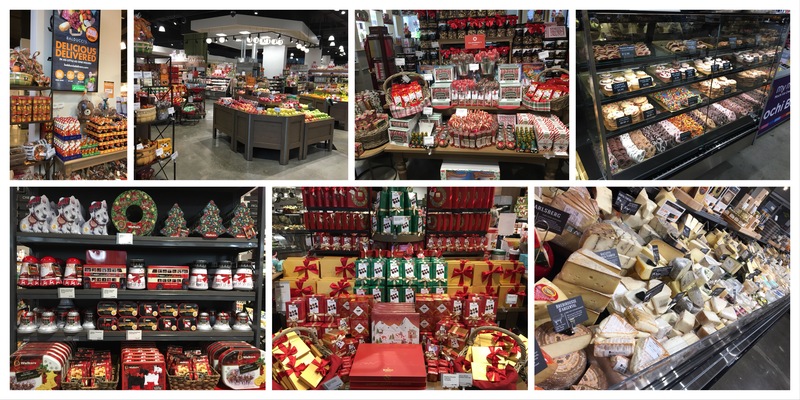 They are all decked out for Christmas, with lots of hard-to-find items and specialty foods all in one place. There is seriously anything and everything a gourmand would desire here. Just walking through makes a food lover feel the Christmas and holiday spirit! I spoke to the head of produce there, and told him his produce was a might pricey. He told me there’s a reason. and it’s a good one! He says they go through the fruits and vegetables multiple times a day to make sure it’s all fresh and perfect, and that he personally checks every box as it comes in off the truck. So that means if you (or your loved one) wants something that isn’t going to go bad in a day or two, or you don’t find has mold on it the minute you get home, Balducci’s is the place! I go there often for things I can’t find anywhere else, like tarragon mustard, imported chocolates, and swanky cheese. The holidays are the time to splurge on swanky cheese! Anyway, you can park there and walk across the street any time! Also, of course the parking is free in all the garages Saturdays and Sundays. and if you just need to run in and pick something up or drop off framing, remember you can always park right out front, as it has 15 minutes grace period. If any of our clients ever get a ticket for being there, we get it taken care of, so just pop back in and i’ll take it to the parking staff. 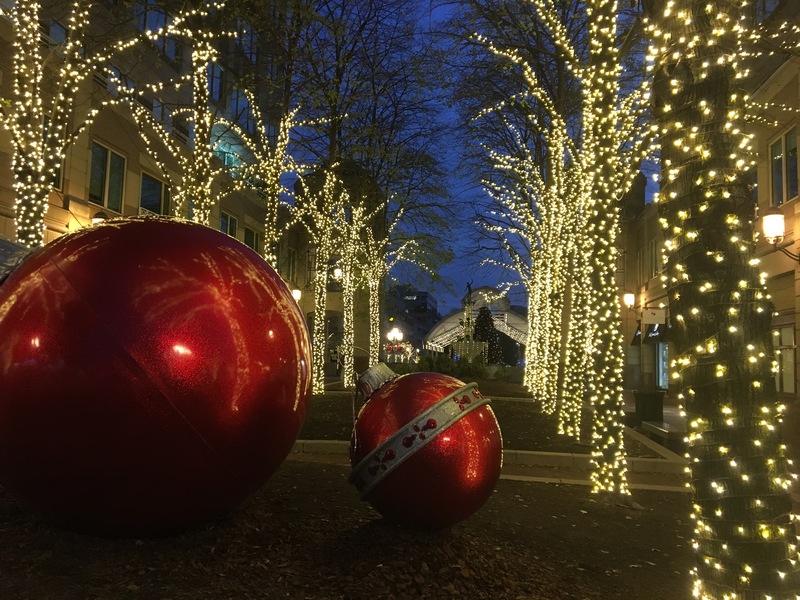 Reston Town Center is dressed for the holidays, and our tree will be lit at a ceremony the day after Thanksgiving. Black (Panther) Friday, we’ll be at the gallery starting at 8am! We’ll have cider and snacks to fortify our friends and clients. We will have a few costumed pals out at the tree after the parade for pictures with the kiddos, and we’ll be open to 6pm. We’ll be open on Christmas eve, from 10-2pm, for last minute pick ups and late shoppers. We’ll be closed from December 31st to the 2nd of January to celebrate the new year. 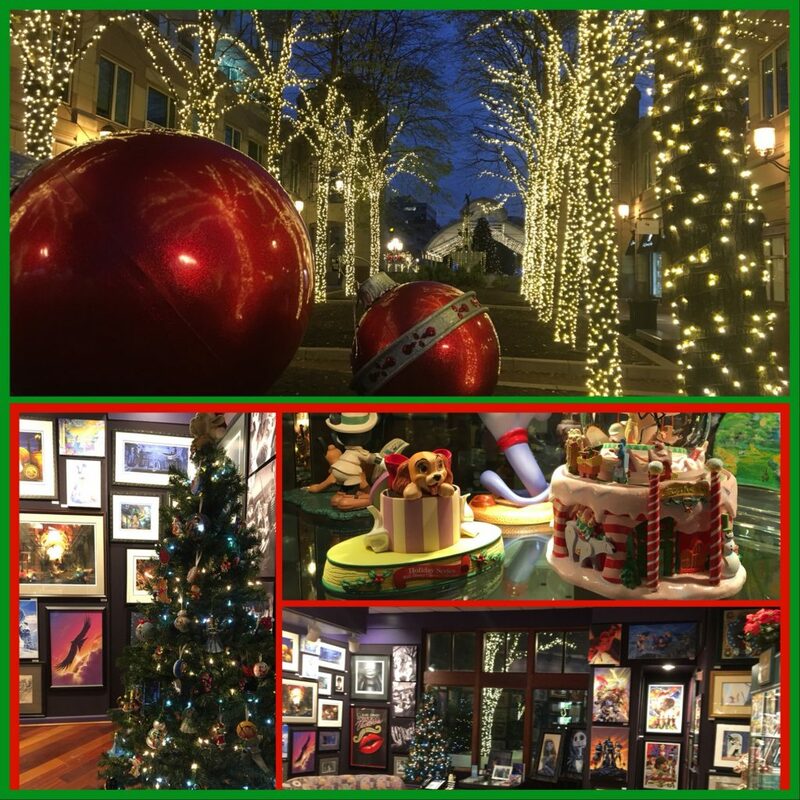 Reston Town Center is actually a wonderful place to do your Christmas shopping! Parking is always free in all the garages on the weekends, there are great places to eat, and not only is there not the crush and crowds you find at the traditional malls, it’s also beautifully decorated during the holidays. They’ve gone the extra step this year, as they’ve been doing the last few years, to make it lovely and charming, especially at night, so come visit us. Remember if you need to plan for coming in outside regular hours, you just need to let us know and we’ll try to arrange it. We are here to help and make the holidays as easy and fun as we can for all. We are gathering fun and exciting items to give to those who make purchases during the holiday season, so from November 17th through December 31st, you’ll get a little something geeky and art-related with every purchase! What is it? You’ll have to come in to find out, but we know it will make your season a little brighter. 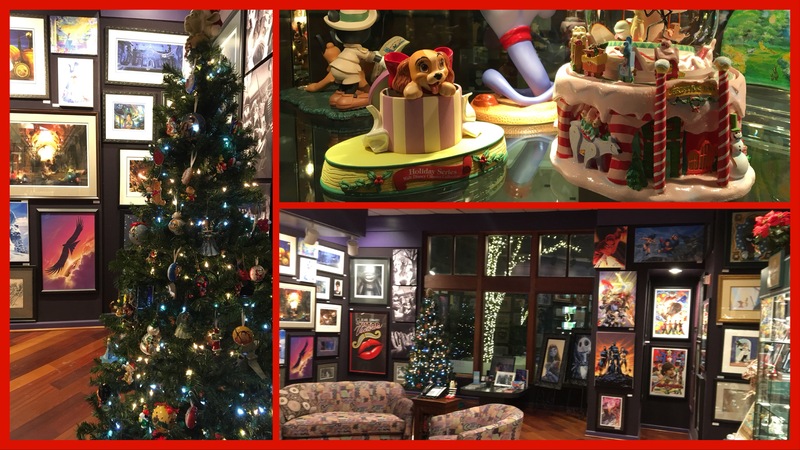 ArtInsights has a great collection of art right now, and we have lights and our Yoda topped tree to remind us all there is no try. As those of you who saw our newsletter and our gift guide blog might have surmised, we have lots of new art, and the gallery is all decked out in holiday finery, so it’s definitely worth a trip. What else is happening? We are about to get a door out to the front of the building. After 26 years, we thought it was time! With all the permit headaches, it’s probably going to be finished at the coldest time of the year, but we’re still excited. We won’t be using it during the winter, but we’ll have lots more air and a great feeling of openness when it’s warmer out. We want to be able to be open when we want, including outside the hours that the building doors are locked. We aren’t sure yet how this will effect our hours, but we’ll write again and let you know when we decide. We are imagining Friday or Saturday night events with music and new art releases. We will have an event to celebrate our new door and other special changes to the space in the spring. We have a newsletter we send out to our clients. We don’t send them very often, but when we have new art, or events, or something cool is happening, we let you know. So it might be bi-monthly? Why don’t you give it a try if you want to keep up with us, read about and see all the latest releases or gallery scoops? Just go to the front page of our website and the popup will show up where you can sign up. Facebook and blogs can only do so much!